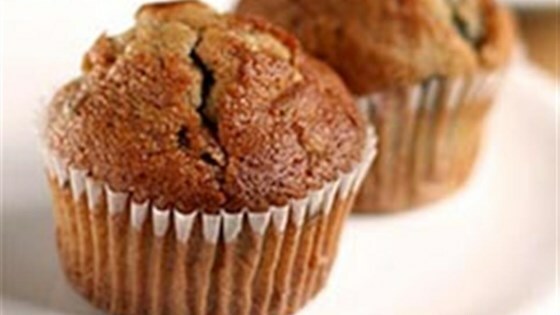 "Delight the pickiest taste buds with this blueberry muffin made with applesauce. Crumble topping is optional but recommended." Preheat the oven to 350 degrees F. Lightly oil or coat 12 muffin cups with nonstick cooking spray and set aside. To make the topping, combine the flour, wheat germ, and brown sugar in a bowl. Add the oil and stir until the dry ingredients are well coated with the oil. Set aside. Meanwhile, whisk together the flour, wheat germ, baking powder, baking soda, cinnamon and salt in a large bowl. Combine the eggs, applesauce, brown sugar, oil, and vanilla in a separate bowl and whisk until well blended. Pour the liquid ingredients over the dry ingredients and stir until just moistened. Gently stir in the blueberries. Spoon the batter into the prepared muffin cups. Arrange the topping evenly over the muffins, using the back of a spoon to gently press the topping into the batter. Bake 20 to 22 minutes, or until the topping is golden and a toothpick inserted in the center comes out clean. I could not find the Mott's Healthy Harvest Blueberry Delight Applesauce so I used Mott's regular applesauce and doubled the fresh blueberries. These were a hit with my family! Moist muffin. I didn't have wheat germ, so subbed finely chopped pecans.